Shortly after my son was born, we started burning through AA batteries. I didn’t like throwing out single use Alkaline batteries. I liked even less having to frequently recharge high discharge NiMH rechargeable batteries. So I was delighted to discover and write about low self-discharge NiMH AA batteries, which work better than both alternatives. If you use a cheap, low quality charger, you may be motivated to abandon even the highest quality rechargeable batteries. You may end up with batteries that don’t fully charge, batteries that overcharge, or (in rare cases) batteries that overheat and melt. Out of several hundred battery charger models, there are at least a few dozen good ones. However, one brand of battery charger stands heads and shoulders above the rest: La Crosse. In this post I describe why good chargers matter, why I like La Crosse chargers so much, and why the La Crosse BC-700 makes the most sense for the most people, even though the more expensive La Crosse BC1000 is arguably the best battery charger on the market. I also describe the minor differences between the 4 La Crosse models listed in the title. There are hundreds of AA battery chargers on the market, most of which cost less than $15 or are bundled with batteries. So why pay $35-$60 for a La Crosse charger or even $20 for a medium priced charger? Q1) Why Buy Rechargeable Batteries and Chargers? A1) I covered this thoroughly in my Best AA Batteries post. Short answer: If you use AA and AAA batteries in nothing more than a few alarm clocks and remote controls, then stick with single use Alkaline batteries. But add just one high drain device such as a digital camera, and you’ll find that low self-discharge rechargeable batteries are more convenient, economical, and ecological over the long run. Q2) Is overcharging bad or dangerous for AA and AAA batteries? A2) Yes to both. If you overcharge the common NiMH AA battery by tiny amounts, there’s no problem. If you overcharge by small to moderate amounts, battery cells become damaged, resulting in gradual reduction of battery life the more times you do this. If you overcharge by large amounts at a rapid charging rate, the cell can be destroyed due to overheating and could possibly start a fire. Q3) What do you need to prevent overcharging AA batteries? A3) You need very slow chargers, timed chargers, or a smart charger. Slow chargers are safe because batteries don’t overheat when charged slowly. The problem is they’re very slow. Timed chargers recharge batteries for a fixed amount of time at a faster rate, but this can lead to overcharging batteries. Smart chargers cost more but are a much better choice for NiMH batteries because they have a method for detecting when the battery is fully charged (usually detecting a voltage drop that occurs when attempting to keep charging a battery that can’t take any more). Q4) What exactly is a smart charger? The term “smart charger” is confusing because it is used in marketing materials to describe several features. The most important feature is to stop charging (or switch to a trickle charge) when the charger senses that one or more batteries are full. Other features related to smart charging include: refresh/conditioning, discharging, testing, trickle charges and independent channels for each charging bay. Q5) Why do I need independent channels for each charging bay? A5) Most smart chargers accommodate 2 or 4 batteries. To keep costs low, the circuitry on many smart chargers is set up to monitor batteries in pairs. This prevents overcharging, but also prevents 1 of the 2 batteries from reaching full charge. By using a smart charger with independent charging channels, each battery will reach full capacity. Freshly charged batteries will therefore last longer, on average. Q6) Do most chargers have smart charger features and independent channels for each charging bay? A6) No. Scanning through the available chargers on Amazon, it appears that less than half of the chargers on the market have these two critical features. Many chargers bundled with rechargeable batteries lack these features. Q7) So it’s obvious you should buy a smart charger with independent charging channels. Why not just buy the cheapest charger with these features? A7) You can if you want. I’ve listed the best I was able to identify at each price point in this Low Self-discharge AA batteries post. There used to be many such models in the $15-$25 range but most have been discontinued, so I’ve come out with several updates since. The latest is the 2018 AA Batteries update. Q8) So why should I buy one of the La Crosse models, given that the least expensive BC-700 model typically costs $32-$38, while the more expensive BC1000 model costs $60? A8) The rest of this post will answer that. For more up-to-date information, including new models, see the 2018 AA Batteries update. What do La Crosse Battery Chargers Offer to Justify Higher Prices? Before delving into details, I should state that the model I’ve used for the past 4 years is the La Crosse BC-900. However, this is one of 4 closely related models, so my experience applies to all 4 models (see next section for minor differences). Accept 1, 2, 3, or 4 batteries and charge each one at the same or different rates than the others. Test batteries: One full discharge/recharge cycle allows battery capacity to be approximately measured. You can then weed out weak batteries and/or group batteries together which have similar capacities. Refresh batteries: Repeatedly discharges and charges the battery until the capacity stops increasing. Do this once every year or two to keep your batteries operating near highest potential capacity. Select different charge (or discharge) rates per battery. The BC-700 maximum charge rate is 700mA, while maximums for the other La Crosse models are 1000mA for 4 batteries or 1800mA for 2 batteries. A dedicated button makes it easy to change the charging rate. Display a wide variety of information on a large, easy to read 2.2” x .8” LCD display spit into 4 sections, one for each battery. The button located beneath each battery bay makes it easy to cycle through each piece of information related to that battery. Maha is the only other charger brand that offers a similar suite of capabilities. In several ways, it offers more. For about the same price as the top of the line La Crosse BC1000, the Maha PowerEx MH-C9000 Charger offers a little more flexibility, a little more control, faster maximum charging rates, a larger size, and a simple method for reviving completely drained batteries. This last is a significant advantage over La Crosse, which displays the “null” message when completely drained batteries are inserted (see problems with La Crosse Chargers below). The larger size can also be considered an advantage because battery insertion/removal is easier and batteries remain cooler when charging at the faster rates. For a very detailed comparison between the two chargers, see NLee’s Amazon review of the Maha PowerEx MH-C9000. So why do I recommend a La Crosse model over the feature-filled Maha MH-C9000? 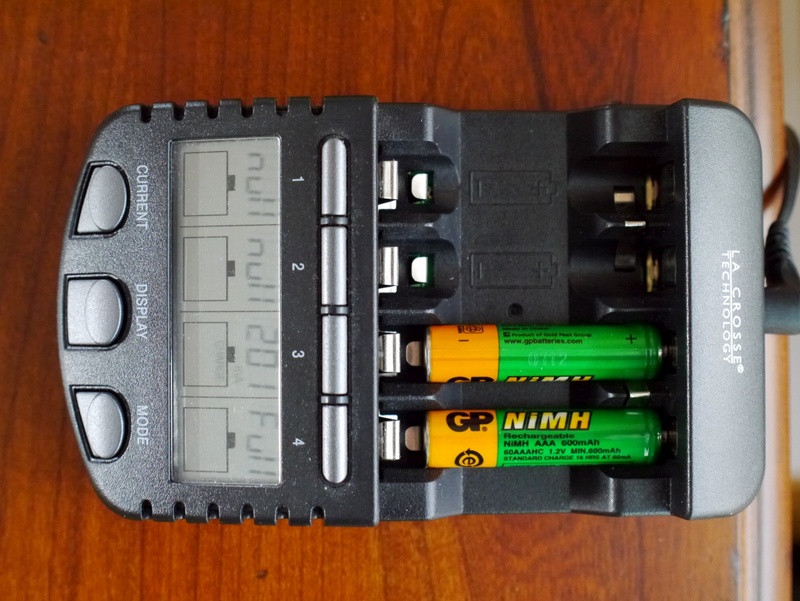 Because the MH-C9000 is far more difficult to use, requiring many more button presses than La Crosse models to perform equivalent functions on a set of 4 batteries. It also has a display which rotates through data on a 48 second cycle as opposed to the La Crosse which has physical buttons that allow you to easily see data for an individual battery. I only recommend Maha for geeks the technically inclined who want the additional flexibility and don’t mind the larger size and ease of use issues. Complex user interfaces are exactly the kind of distraction FilterJoe aims to avoid. BC-700: This model is inexpensive, usually costing around $35. Its maximum charging rate is 700mA. The other 3 La Crosse models are more expensive but charge at faster rates and include accessories. BC-900, BC9009: These two models have equivalent functionality but are differently colored and have different firmware versions. Both models can charge faster than the BC-700 (1800 mA max for 2 cells, 1000mA max for 4 cells) and include the following accessories: carrying case, 4 C adapters, 4 D adapters, 4 AA batteries, and 4 AAA batteries. While the carrying cases and adapters are handy, the included batteries are low quality, high discharge NiMH batteries. A big problem with these two models is that they sometimes overheat batteries when charging at the fastest rates. If you use either of these models at the default charging rate of 200mA there’s no danger, but you may not want to risk using either of these chargers to charge at rates higher than 700mA. I personally almost always use the 200mA rate for AAA batteries and 500mA for AA batteries which is gentler on batteries than fast charging. Using low charge rates leads to longer battery life. BC1000: This model was released in 2011 and is identical to the BC-900 and BC-9009 (including carrying bag, accessories and faster maximum charging rates), except that additional overheat detection circuitry is also included. If too hot conditions are detected, the unit simply stops all charging or discharging activity on all 4 cells. Too many customers reported their BC-900 or BC-9009 units melting due to overheating when charging at the fastest rates. The BC1000 appears to have solved this issue and is the best unit for those who frequently feel the need to charge their batteries quickly, at a rate higher than 700 mA. Some La Crosse models, including 2 of the 4 models discussed in this post (BC-900 and BC-9009) have had numerous reports of overheating and melted batteries. The company has never publicly admitted to these problems or issued any recalls. There are many reports of dissatisfaction with La Crosse customer service. These chargers slide around easily, because they are light and have no rubber stoppers on the bottom. La Crosse chargers display a cryptic “null” message when a heavily depleted battery is inserted. According to the manual, this means that the battery is defective. In most cases this is not true. It means that the voltage is below the 0.5V threshold needed for live battery detection. This encourages users to throw out good batteries that happen to dip below 0.5 Volts. We have two devices that frequently draw dawn batteries below this threshold. There are two ways to rescue dead batteries with a La Crosse charger, neither of which are described in the manual. The simplest is to leave the dead battery in the charger for several days. The La Crosse charger sends a tiny sense current of 60uA to detect the presence of a cell, which is usually enough to raise the battery above the 0.5V threshold (after which it can be charged normally). A faster method is to unplug the charger and use a paperclip to short the dead battery together with a fully charged battery, to share some of the stored energy. The procedure is described here. The simplest dead battery revival method is to use a “dumb” charger or timed charger for an hour or two, and then put the batteries back into the La Crosse charger. None of the workarounds I described are convenient. I consider the lack of a battery rescue feature to be the biggest disadvantage of the La Crosse as compared with the Maha charger I described above. To change settings, all La Crosse chargers require that you start making changes within 8 seconds of battery insertion. The first required action is to hold down the mode button for 3 seconds. If you’re too slow (because you don’t have a plan for which buttons you’re going to press) or you don’t hold down the mode button long enough, you’ll need to withdraw the batteries and reinsert to start over. In my original article on low self-discharge AA batteries, I had already mentioned several smart chargers that do the job, including several that cost less than any of the La Crosse models. Any of those are fine. However, if you’ve taken the trouble to read through most of this post, I’m guessing you go through a lot of batteries and want a better model. The La Crosse Technology BC-700 Alpha Power Battery Charger is that model. It costs around $35 and does pretty much everything other models do except charge batteries at a rate higher than 700mA. Batteries charged at these lower rates will tend to last for a longer number of recharges than those charged at faster rates. If it’s important to you to charge your batteries quickly and/or acquire the carrying bag and accessories, then get the La Crosse Technology BC1000 Alpha Power Battery Charger. It typically costs $60, but allows for faster charging while avoiding the overheating and melting batteries issues of the BC-900 and BC-9009 models (which I don’t recommend). Lastly, don’t skimp on batteries. To get the most out of your charger, be sure to use low self-discharge batteries such as the Eneloop batteries made by Sanyo. Like good chargers, they cost more up front, but save time and money in the long run. I bought the Sony Cycle Energy BCG34HRE4KN Refresh Charger and 4 Pre-Charged 2000 mAh AA Batteries, one of the chargers that you recommended in your excellent post on low discharge rechargeable batteries. Should I replace it with one of the La Crosse chargers described in this article? The Sony Cycle Energy BCG34HRE4KN with 4 Pre-Charged 2000 mAh AA Batteries is a great bargain given that it meets the minimum requirements of being a smart charger with independent charging channels and 4 included high quality low self-discharge batteries. From what I know of your situation, you use it to rotate two sets of batteries that you use in your digital camera that you use primarily on trips. So in your case, I wouldn’t bother getting the La Crosse as you might never use the additional features and you already have a good charger. It is my impression that most people in the U.S. with school-aged kids have many devices and use far more than 8 AA and AAA batteries. For them I would recommend the La Crosse as sooner or later they may want to test their batteries, refresh them, charge them faster, etc. Thanks for the great post! i didn’t realize my LaCrosse charger has so many features. I will have to start using them appropriately. I would like to know, how can I see the actual totally power (Mah) in the battery, so i can see it is ok, or I have to discharge/refresh it. I did read that it is the “charge test” mode. I tried this but I can not read it yet on the display. Any suggestions/instructions is appreciated. Test mode fully discharges then recharges a battery, which can take 2 to 30 hours depending on battery capacity. So it may be a full day before you see the capacity displayed. You can make that go faster by following instructions for increasing the rates of discharge and recharge. But there is something that bothers me. The manual says to only use the AC adapter that goes with the package. What happens when the AC adapter gets lost, or broke? Are there other compatible adapters for this? The manual says to only use the AC adapter that goes with the package. What happens when the AC adapter gets lost, or broke? Are there other compatible adapters for this? You raise a good point. I did a few minutes of research and it doesn’t look like La Crosse sells replacements. The AC adapter is definitely not generic, so if the adapter breaks or is lost, you’re out of luck. I would point out that the BC-900, BC-9009, and BC1000 all come with carrying cases so when done using the charger I always put the charger and adapter in the carrying case. Unless I lose the entire carrying case, I’m not likely to lose the charger. An excellent review. While the BC-700 will serve many people’s needs very well, there is an alternative to the BC-1000 or MH-C9000 for those who require rapid charging – the Accupower IQ-328. From what I’ve been able to determine it’s a rebranded BC-1000 with reduced functionality as it’s missing the individual slot selection buttons, which limits running concurrent test/refresh/discharge jobs somewhat. It defaults to charging for any batteries inserted after a program has been started, so it suffices for 99% of people’s needs. Excellent tips on the NULL cases for good batteries. I have run into this with brand new batteries. Thanks! Hi Joe, great article! Can I please ask you to clarify the portion about reviving ‘null’ batteries (this part— A faster method is to use a paperclip to short the dead battery together with a fully charged battery, to share some of the stored energy. The procedure is described here. )? ONLY DO THIS WITH THE POWER DISCONNECTED FROM THE UNIT might be a good addition to that sentence, people might do it while powered up and that may distroy the charger! Thanks for your helpful post! Thanks for the suggestion! Change made. Great article / review. I actually never checked the output on my bc900 adapter, 3V 4Amps! very unusual, I have a box of over 50 adapters I saved and I know none are that output, kinda said I will just have to get another unit if it ever fails. O well, still a great charger. If I’m understanding you’re question correctly, La Crosse chargers and most chargers on the market that do both AA and AAA batteries have two sets of contacts, a large one for the AA batteries and a smaller one for the AAA batteries that don’t get in the way of the AA batteries. So there’s no chance of damaging contact points. I’ve never damaged any of mine and never heard of anyone getting their contact points damaged. Default charging rate is 200mA which is just right for gentle charging for AAA batteries but a bit slow for AA batteries. So with a couple button presses I usually charge my AA batteries at the 500mA rate. Thanks for the response. The question i have is how do you get the aaa batery contacts to fit the battery. With the AA configuration the AAA are obviously too small, so how does the AAA prong fit? See how there’s a very small metal contact closer in than the AA contact? It’s small enough that when you put a larger AA battery in, it does not block. But the smaller AAA batteries fit just perfectly. Thanks a lot Joe. To say that it was simple would be an understatement. For some reason my mind wanted to think that one of the prongs flips up but in fact it’s just right there ,so once again thanks for your time. Previous Previous post: Want the quietest PC? Just get the right chip . . .
Next Next post: Keep iPhone Plugged In? Yes!